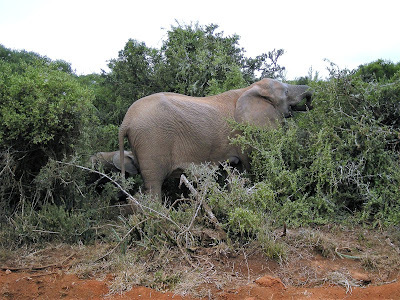 TravelComments.com Official Blog: Addo Elephant National Park: Visitor numbers exceed 300 000 in 2017/18! Addo Elephant National Park: Visitor numbers exceed 300 000 in 2017/18! South African National Parks (SANParks) has released the visitor numbers to Addo Elephant National Park in South Africa's Eastern Cape. According to SANParks, the Park had 305 510 guests between 01 April 2017 and 31 March 2018. This represents an increase of 15% on the same period in 2016/17 with 265 585 guests to Addo Elephant National Park. Slightly over half of these were international tourists – 158 162 (52%), with 146 091 South Africans (47%) while 1 257 visitors from Southern African Development Community (SADC) countries made up the minority. Dissected into day/overnight visitors, 82% or 250 232 were day visitors, while the remaining 18%, or 55 278 were overnight guests. The majority of South African visitors to Addo Elephant National Park originated from the Eastern Cape – 101 374 which represents 69% of the total, followed by 21% or 30 448 from the Western Cape. Germany, Netherlands and United Kingdom were the Addo Elephant National Park's top three overseas markets, which represented 87 146 (55%), 15 391 (10%) and 8 361 (5%) of the international market respectively.